Tom Waits' "Bad As Me" LP. For decades, Rock n’ Roll has been thought of as a young man’s trade; the energy to sustain its demands on the mind, body and soul is no match for the weary. 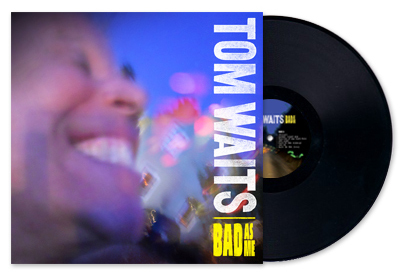 As true as that idea my be, rockers like Tom Waits (now 61), who continues to play by his own rules and charming madness, again goes beyond the borders of his own conventionalism with his 17th studio album, “Bad As Me” now available for the taking. This collection of thirteen brand new recordings, Waits’ first album of new material in 7 years, illustrates more and more what makes the man and his music deliriously strange and comforting, from the raise-up-the-dead ruckus of the album’s opening track, “Chicago,” to the forlorn sigh of the album’s closer, “New Year’s Eve.” Despite being a relatively short album, Waits doesn’t skimp out on covering a range of moods in between with his ultimate tearoom orchestra, consisting of appearances by Flea, Les Claypool, Keith Richards, Charlie Musslewhite, David Hildalgo and Marc Ribot. It really takes a beautifully off-kilter and slanted person to be a fan of Waits and wife/writing partner, Kathleen Brennan, to begin with, as the darkness and mystery of their writing isn’t for the square or easily frightened. Though, beyond the the sounds of Waits’ junkyard ensemble and hell-hound voice, there is a beauty and authenticity in his lyrics and compositions that make his work easily accessible and equally enigmatic. Despite Waits’ reputation for sounding like Hell’s drill sergeant, gargling with Ajax and rock salt, listen closely and you can still hear the young Mose Allison and Jack Kerouac influenced pianist and crooner on “Kiss Me,” accompanied by Marcus Shelly on bass, as well as “Last Leaf”, a touching story about the last leaf on a tree hanging on in the dead of winter. There is no use in attempting to label Waits’ under any kind of music genre, as he has done remarkably well avoiding conventional labels over the last four decades of his recording career. In ways, Waits seems to run neck and neck with Bob Dylan on who is more enigmatic and mysterious, strange and more genius. Obviously, both take their own cake when it comes to legend, but like both artists people will still be talking about them for decades, even centuries to come. “Bad As Me” is just one more example why we’ll all be talking. This entry was posted on Monday, October 24th, 2011 at 7:45 pm	and is filed under Music. You can follow any responses to this entry through the RSS 2.0 feed. You can skip to the end and leave a response. Pinging is currently not allowed. « BRYAN’S MUST OWN BLURAY/DVD’S FOR THE 4TH WEEK OF OCTOBER!! !